Brigandine of a German knight of XIV century is a good alternative to chainmail. Such body armor was used as by common soldires, so by commanders and rich warriors. This model of brigandine is based on the scientific publication "The riders of the war. European Cavalry" by Aleksinsky, Zhukov, Butyagin, Korovkin, 2005 year. 3-holes plates of 4*6 cm are riveted to the firm base. Distance between the plates in row is 1.0 cm. Overlap between the rows is 1.0 cm. Fastenings are placed on the sides and shoulders of armor. These strong leather belats with steel or cast bronze buckles allow comfortable wearing and fastening without external assistance. In options, we offer you to choose type and thickness of plates, for example, cold-rolled, hardened or stainless steel, or titanium. Cover materials of brigand armor was always showing social class and wealth of wearer. Noble and rich military men were using velvet, suede or leather brigandines, oftne highly decorated with breastplates, chains or blazons. Poor soldier could afford wool armor with the simplest rivets and buckles. Various fastenings and types of decoration are available for order. We can make an embroidery of your heraldic emblem on the brigandine, or decorate the bottom edge with fancy festoons. 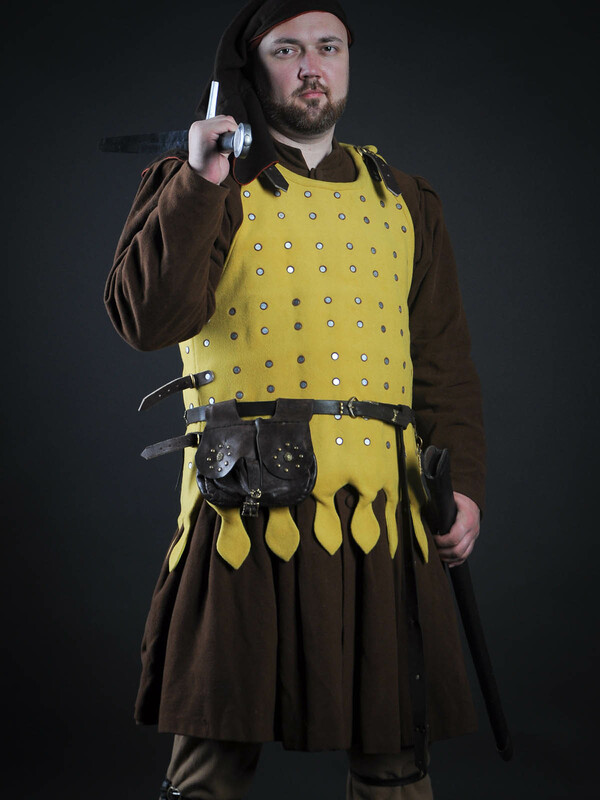 Brigandine, whole-hammered or metal spaulders provide with additional protection. If you choose half-coloured or quarter-coloured brigandine, please inform us via [email protected], what colours you prefer and its exact layout. Please have a look at similar models of brigand armor with fastenings on the sides: European brigandine of the XV-XVI centuries, brigandine with fastenings on the sides. 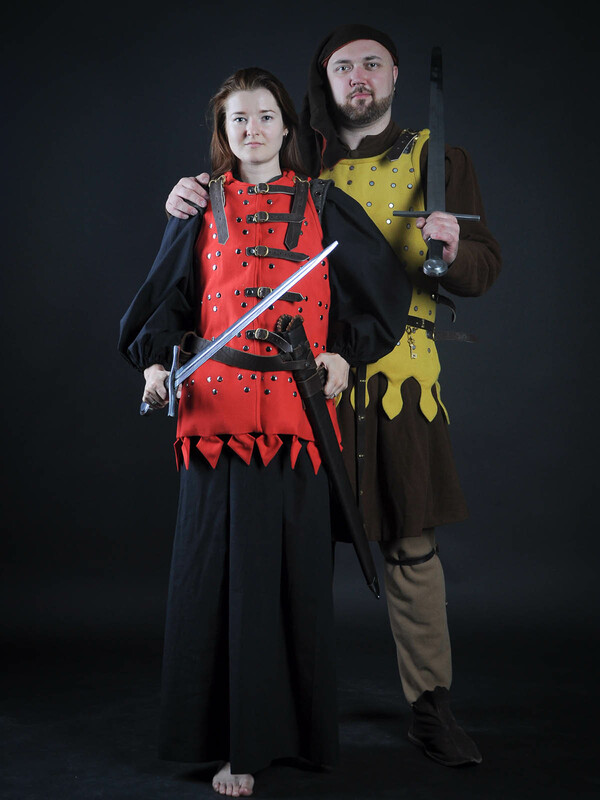 This medieval brigandine goes perfect together with gambeson, brigandine arms and legs protection. In section “Brigandines” you can see all models of brigandines for sale. If you didn’t find any for your taste and wish, please send us photo and description of the required model and we will make it for you. 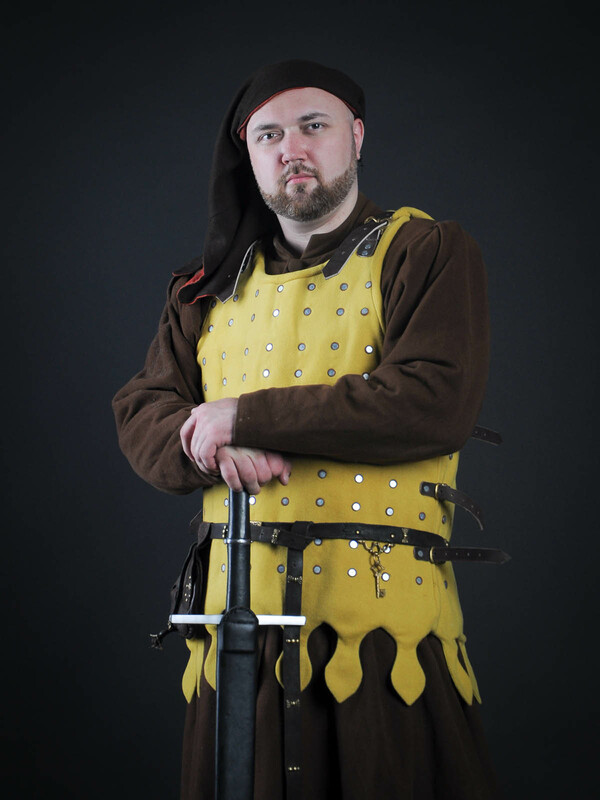 We also offer you read short review about brigandine and choosing of a brigand body protection. 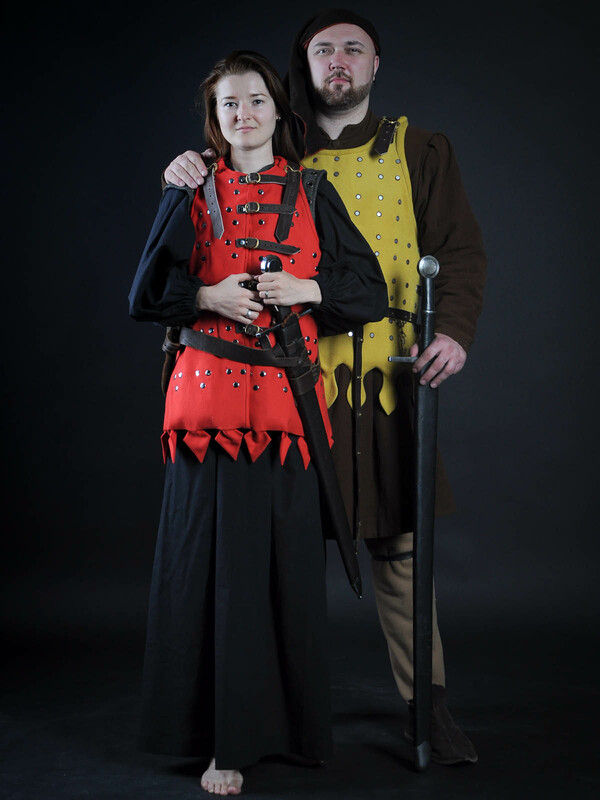 This article will tell you about materials and fabrics for this medieval armor. When overlapped, thickness of 40% of brigandine becomes 2.0 mm. Good for any types of fights (HEMA, SCA). Historically authentic metal. When overlapped, thickness of 40% of brigandine becomes 3.0 mm. Good for any types of fights (HEMA, SCA). Historically authentic metal. When overlapped, thickness of 40% of brigandine becomes 2 mm. It is not historically correct material. Advantages: titanium is light and firm metal. Protection level of titanium 1 mm is equal to 1.5 mm of stall or stainless steel. Weight is lighter at 35% (for example, S-size with steel 1 mm is about 6 kg; with stainless steel 1 mm - 9 kg, but with titanium is about 4 kg.). Weight depends on the model of armor. Steel (or stainless steel) plate with riveted painted leather. Pattern on leather is handmade. Price includes pattern by your draft. Size varies depending on the size of brigandine, from 20*15 cm to 25*20 cm. We use two-layered leather for these belts. Mostly, it has fleur-de-lis shape. Steel plate with installed brass etched plate over it. Price includes etching by your draft. Size varies depending on the size of brigandine, from 20*15 cm to 25*20 cm. Price is specified for simple pattern. Please send your emblem to [email protected], so we could calculate price for you. 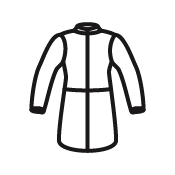 Emblem can be hand-sewn or machine-sewn. Size may be chosen by you: from 8*4.5 cm to the size of the whole brigandine. Plates of size 7*7 cm (2,7*2,7 inches) without overlapping, for two rivets. 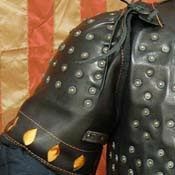 Outer material and metal of spaulders are the same as outer fabric and metal for plates of the whole brigandine. Length is ¾, without reaching an elbow. 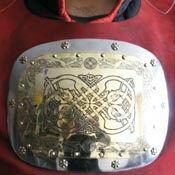 Outer material and metal of spaulders are the same as outer fabric and metal for plates of the whole brigandine. Length is until the middle of the upper part of arm. Historically authentic model, based on the findings from Visby. Metal of spaulders is the same as metal for plates of the whole brigandine. Short spaulders, cover only the shoulder and a little bit the upper part of arm. Brigandine with fastenings on the sides was one of the most wide-spread type of plates’ body protection among all military groups during the centuries, while it's not been displaced with medieval plate armor. Design allows comfortable wearing without any help and good protective qualities during the fight. You can use this brigandine armor for: SCA HEMA Larp Stage performances Medieval festivals Reenactment events Made-to-measure brigandine is completely handcrafted. Plates of brigandine are overlapped. Firm leather belts for fastening are placed on the sides. Base price includes following options: Black wool for outer shell; Cotton for inner shell; Plates of cold-rolled steel 1.0 mm; Steel finding rivets; Black leather straps; Steel nickel-plated buckles; Straight bottom edge; XS-size; No decoration; Depending on the wealth and social class, knight were wearing brigandines of different materials. Common infantrymen and poor warriors could afford brigand armor covered ..
Khatangu-degel armour is the Asian version of the plate armor - brigandine. Such plates’ armor was very popular among the Tatar-Mongolian and Russian warriors in the XIII-XIV centuries. Models of this body protection could vary, but all of them had similar features, such as metal plates, riveted over or under thick fabric base. Khatangu could have additional protection, like spaulders or tasses. Design allowed comfortable moving as to dismounted warriors, so to horsemen. 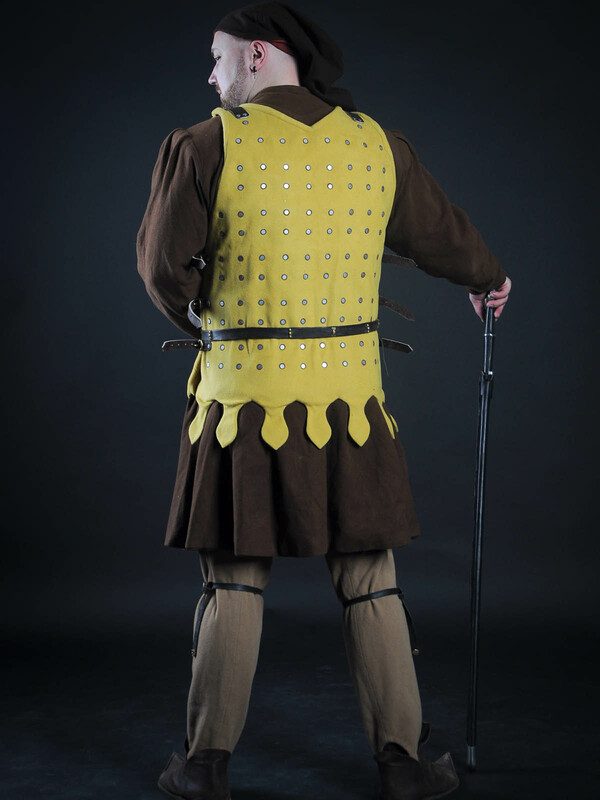 This medieval suit of armor includes several parts: Mid-thigh length jacket with leather belts for fastening on the sides; Two-part skirt for thigh protection. It is attached to the jacket with leather belts; Spaulders with collar. Spaulders has leather belts for attaching to the body part; Crotch piece. You can use this brigantine armour for: SCA HEMA Larp Stage performances Medieval festivals Reenactment events Made-to-measure medieval body armor is completely handcrafted. 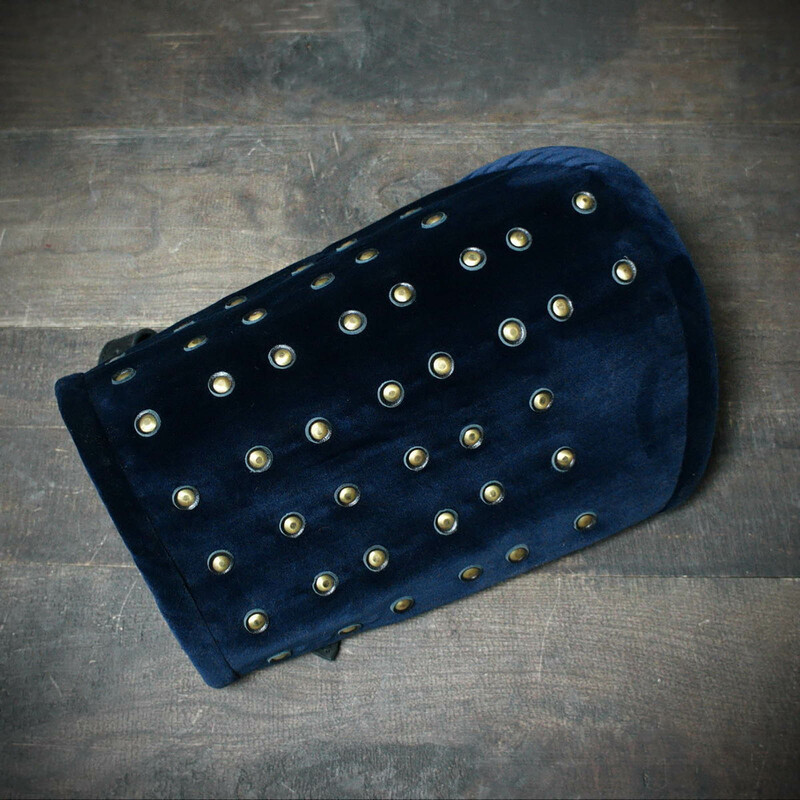 Our artisans make..
Brigandine of European knight represents one of the early versions of this type of medieval body armour. This model is recreated on the basis of archaeological and pictorial sources of the XIII-XIV centuries. 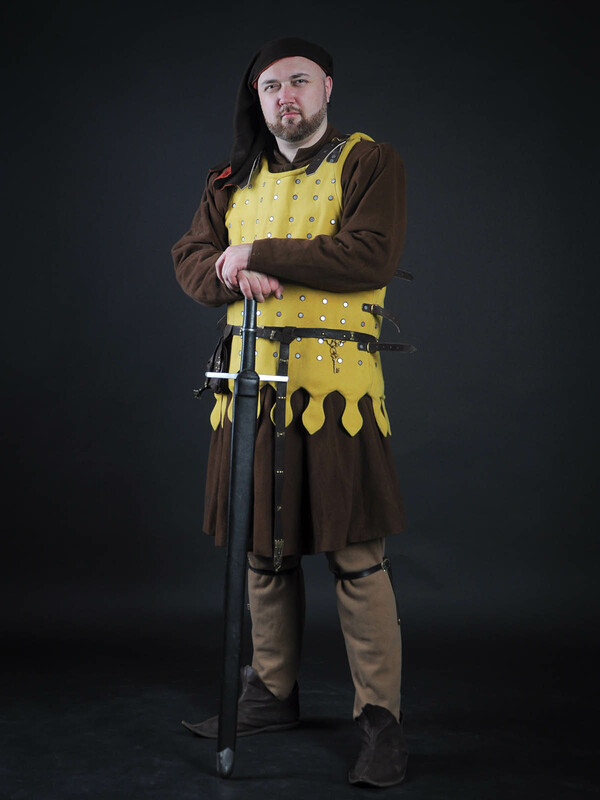 You can use this brigandine armor for: SCA HEMA Larp Stage performances Medieval festivals Reenactment events Made-to-measure brigandine armour is completely handcrafted. The length of brigandine is under knee. The cuts from the front and from the rear provide with a good mobility as for the mounted knights, so for infantrymen. 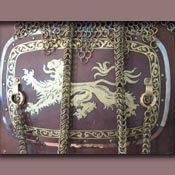 Leather fastenings with buckles are placed on the back of armor, so chest and belly completely covered with plates that guarantee good protection of the major organs. Base price includes following options: Black wool for outer shell; Cotton for inner shell; Plates of cold-rolled steel 1.0 mm; Steel finding rivets; Black leather straps; Steel nickel-plated buckles; Straight bottom edge; XS-size; No decoration Rich knight were wearing briga..
European brigandine of the XV-XVI centuries is a model of the late Middle Ages. It was popular among all military branches, while hadn’t been replaced by full-plate armour. This model of plates’ armor is based on the brigandine pattern from the scientific publication "The riders of the war. European Cavalry" by Aleksinsky, Zhukov, Butyagin, Korovkin, 2005 year. 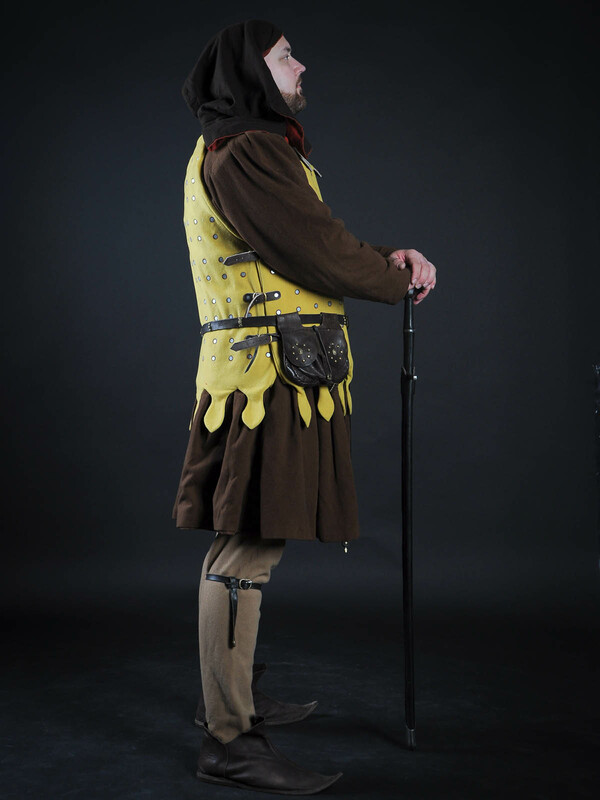 You can use this brigand armor for: SCA HEMA Larp Stage performances Medieval festivals Reenactment events Made-to-measure medieval brigandine is completely handcrafted. Leather belts with steel or cast bronze buckles for fastenings are placed on the sides of armor. You may easily put on this brgand armor without any help. Base price includes following options: Black wool for outer shell; Cotton for inner shell; Plates of cold-rolled steel 1.0 mm; Steel finding rivets; Black leather straps; Steel nickel-plated buckles; Straight bottom edge; XS-size; No decoration In options, we offer you to choose type and .. This model of brigandine was typical for the Spanish region of XV century. Such brigand armor was actively used by knights and common foot soldiers before the full-plate armor has appeared. Design of this plates’ armor is based on the brigandine pattern from the scientific publication "The riders of the war. European Cavalry" by Aleksinsky, Zhukov, Butyagin, Korovkin, 2005 year. You can use this brigandine body armor for: SCA HEMA Larp Stage performances Medieval festivals Reenactment events Made-to-measure medieval body protection is completely handcrafted. We use personal parameters and regards of each customer to make such battle armor. Plates of size 6*6 cm have 4 holes for rivets and placed back-to-back. Leather belts with buckles for fastenings are placed from the front of brigandine. 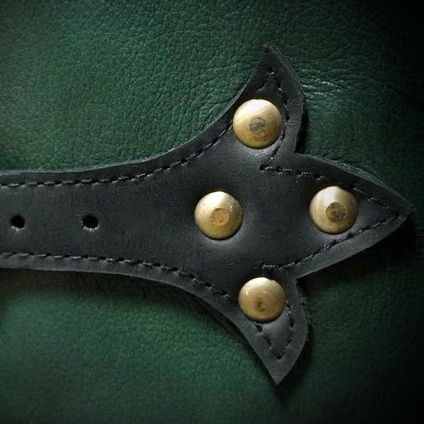 Base price includes following options: Black wool for outer shell; Cotton for inner shell; Plates of cold-rolled steel 1.0 mm; Steel finding rivets; Black leather straps; Steel ni..
Khatangu Degel is an Asian type of brigandine, which was very popular among Tatar-Mongol warriors in the Golden Horde. This model was widespread in XIV-XV centuries. It is very comfortable and provides with perfect protection during trainings, medieval fencing or buhurts. Three-holes plates are of 9*13 cm. Design is based on the images of plates, which were found in Iyi-Kulak hiding (Tuva) (Gorelik M.V. “Mongol-Tatar defensive armament in the XIV-XV centuries”). This medieval suit of armour includes several parts: Body part. It consists of back and front parts with cuts for better mobility. Two parts are fixed to each other with leather belts, installed on the shoulders and sides. Leather belts with steel or brass buckles allow adjusting the size of body protection, if necessary. Wide spaulders. They are fixed with leather belts and completely covers all upper part of the arm. Thighs’ protection. Two large brigandine pieces have wide loops on their upper part, so belt can be easily passed through these loops. Belt w..